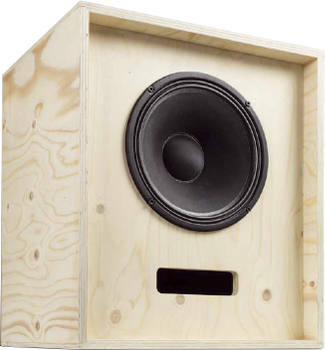 Celeste is a big compact loudspeaker with Celestion coaxial driver. It is developed by Thomas Schmidt and Holger Barske as bass reflex system. The coaxial system is as such no longer identifiable because the tweeter is hidden under the dust protection. The crossover consists of a second order high pass filter (12 dB per octave slope) and a 3rd order low pass filter.. Note: The coils L3 and L4 are delivered with 0.7 mm wire instead of 0.5 mm in the description of magazin K+T. Our high-end version employs Mundorf baked varnish air core coils. In series to the tweeter a ClarityCap capacitor of type ESA is used. Elsewhere we deliver Audaphon polypropylen capacitors. Our high-end version for higher levels employs Mundorf copper foil coils. In series to the tweeter instead of one 10 Ohm resistor two resistors of 18 and 22 Ohm in parallel are used.